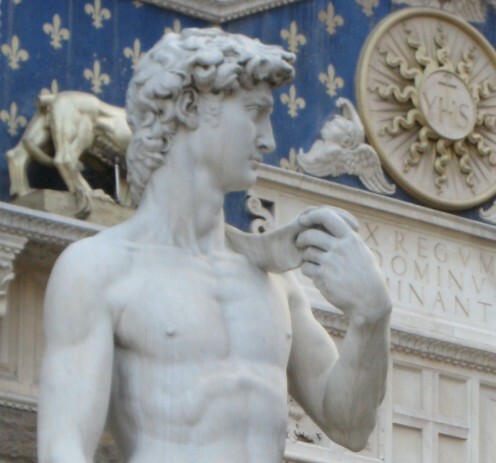 Ten Good Reasons to Visit Italy, with pictures. 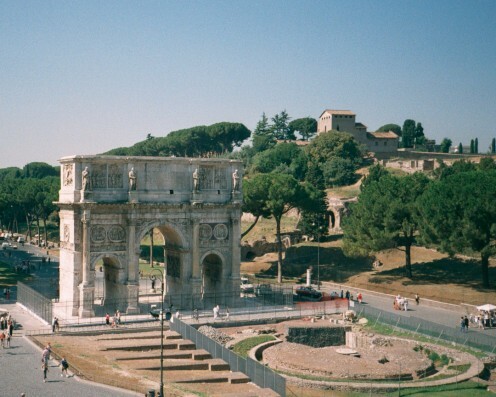 Ancient Rome there is still much to visit and explore. 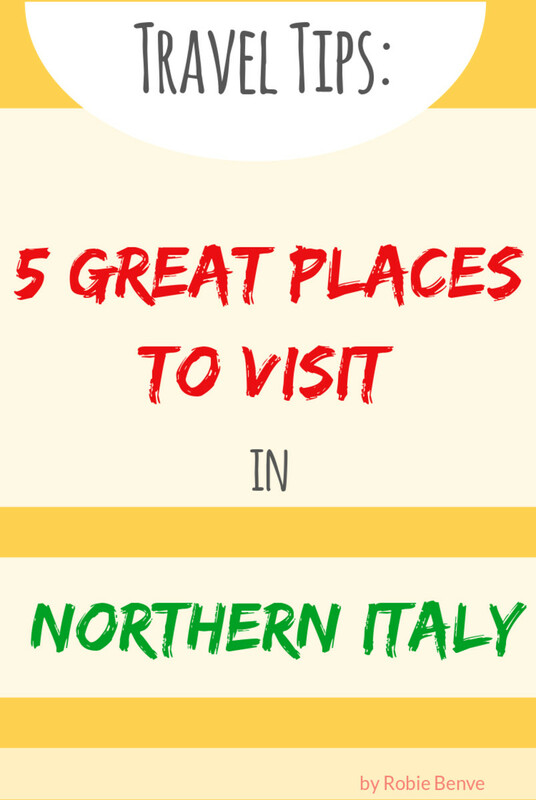 Ten Good Reasons To Visit Italy. Reason One: For The Food. To Eat Authentic Italian Food. It does not matter if you can only afford a pizza or a simple bowl of pasta you will almost certainly be served a meal that has been prepared with skill. The pizzas are usually baked in a wood burning stove and there is nothing better than an authentic Italian pizza Margherita when you are hungry ( the Margherita is named after an Italian queen and its colours are red, white and green like the Italian flag. Red is the the tomatoes, white (is the pizza dough) and green ( is the basil topping). Italian pasta cooked perfectly and al dente (firm ' to the tooth') in a tasty sauce sprinkled with the wonderful cheese made only in Parma, Italy .. Parmesan or Parmigiano Reggiano to give it its Italian name. Reason Two: For The Wine… to drink Italian wine in Italy. As wonderful as Italian wines are at home; for some reason they always taste better when you drink them in the country that they were created in. Reason Three: To Eat Real Italian Ice Cream. The variety of flavours will leave you spoilt for choice; we often have to ask them to serve someone else while we pick which flavour will be our favorite that day. Crema, peach, lemon, strawberry, pistachio, coffee, chocolate, chocolate and nut,Nutella, pineapple, spagnola, tutti frutti, fruit of the forest, mango. Not forgetting- trifle charmingly named Zuppa Inglese and here I will translate it from the Italian into English as I have been told it, it is called “soup of the English”. There are many more varieties/flavours than I can list here. photo: Gelateria. 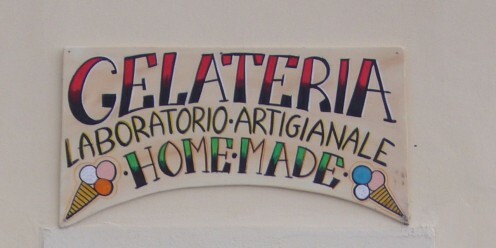 The sign over an Italian Ice cream sellers shop. Roman Temple Photo taken in Rome,Forum Area. Italian towns and cities are interesting to explore. Reason Four: The Cities & Towns. Each city has a different atmosphere and the old (vechio) and modern architecture are both in their own way interesting to see. For example Rome has ‘at its heart’ a bustling city of stylish shops and busy traffic but pause for a moment and look around you and you are surrounded by it’s ancient past you are but a few steps away the ruins of it’s The Forum, Palantine Hill, The Colosseum. Walk through these places and yes the noise of the city is still therein the distance. But can you not also feel the hand of the past on your shoulder as you stare down into the place were the animals were kept beneath the Colosseum? When read of how much blood was shed in that one place hundreds of years ago, you can feel your blood run cold in the middle of Summer. 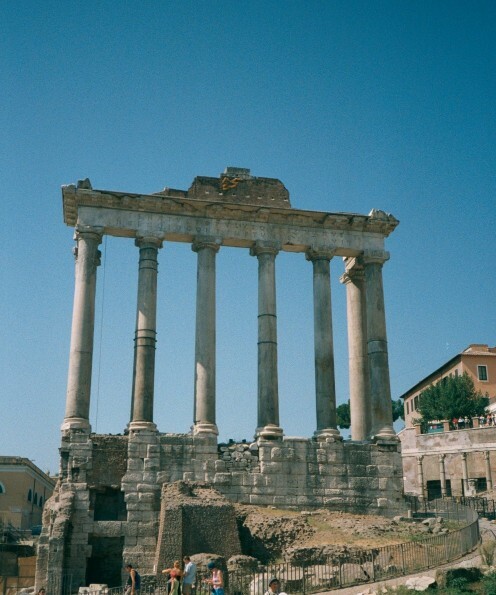 You can look up at the ancient columns around the Forum area and see the places on them where the once famous Romans had their names removed when thy fell from grace and favour. Visit Florence for it’s art, Pisa for it’s tower & Venice because you will feel you have to for nowhere else is quite like it. But If you have the opportunity Bologna and Parma are both fine cities and you will not be at a loss for something to do or see there. Reason Five: To Drink A Cappuccino... a real Italian cappuccino made by a barista. Baristas in Italy have coffee making down to an art form; in Milan I was presented with a cappuccino with a perfectly formed chocolate (powder) heart resting on its froth, this was produced with a flourish and no stencil was used. Please see my Italian coffee page for more about this 'art'. 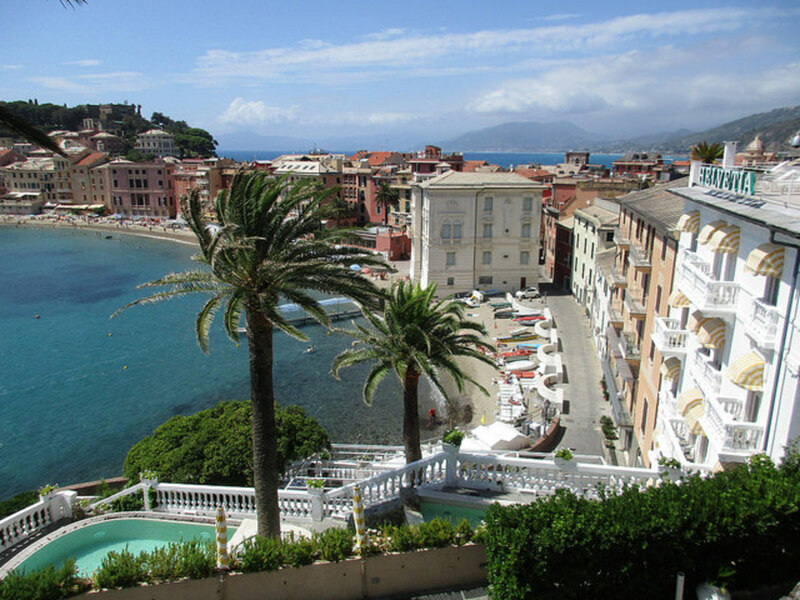 Reason Six: Beauty.. Italy is a beautiful country to visit. The landscape, the weather, the good taste and style that the Italians live by. This does not need much of an explanation; even just window shopping is a pleasure there. The quality of the displays in windows is amazing. The window displays range from a display of hats so magnificient you will think that you have stepped back in time to the most modern of designer shoes, clothes and bags in streets dedicated to famous designer names such as Prada and Jimmy Choo. There is a shop with leather gloves in all the colours of the rainbow on sale in a shop near the Spanish steps in Rome. I can spend ours just looking in shop windows in Italy... I rarely buy anything because if the restrictions on luggage; we travel light. For the most fantastic display of chocolate visit Turin at Easter and see chocolate making turned into tempting master pieces. Reason Eight: The Lifestyle... families matter. This is always pleasure to witness Italians are still mostly very good at getting together as families. Everyone will be included in a meal out at a restaurant from great grandma to the latest arrival. They all share a love of good food and company. They enjoy the camaraderie of dining together and of meeting old friends and stopping to talk when out and about walking or cycling in the town, In Summer the retired people sit in parks in the shade of trees and pass the time of day together. Watching the Italians go about their daily life with an air of gracefulness. Women ride their bikes elegantly no matter what they are wearing and shopping is no problem as it is put it in the basket on the front of the bicycle. 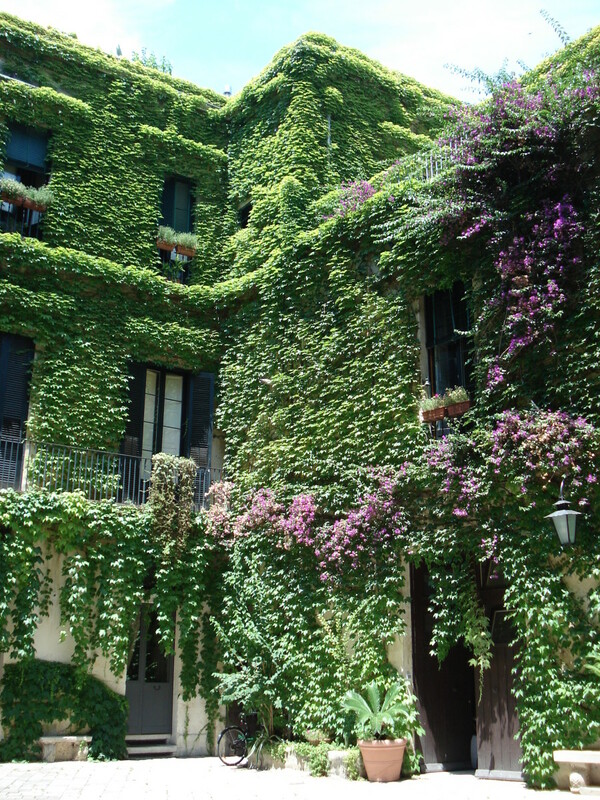 Even in the heat of the summer in the city the men and women of Italian cities look unruffled and elegant. Reason Ten: The Local Markets. 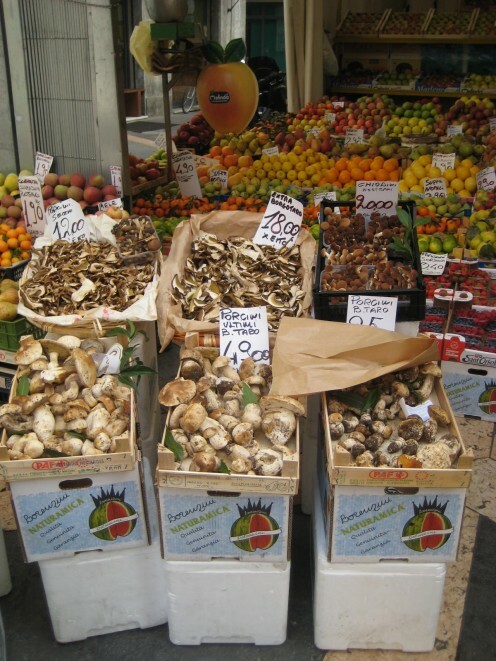 The Italians love a good market, it is a meeting place and a hub of activity. The Italian women will sort through a pile of clothes heaped on a stall. Suddenly she manages to pull out from the tangle of clothes a dress or skirt that looks unpromising. Then holding it up against herself she will judge if it is suitable; if they are lucky there is a mirror to look in. Then like magic you suddenly realise how well it does suits them; it is perfect for them size,style and price. The fruit stalls are piled high with the most colourful and fresh fruit and vegetables, so well arranged they could be in a painting. The local markets are all slightly different they may be set in close proximity to historical buildings but when the market is in town it takes centre stage. Italian's take great pride and care in the way they present their food. 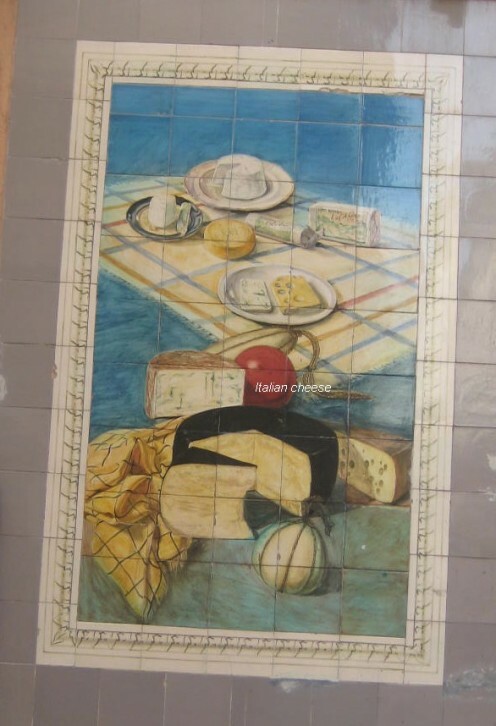 Artisitc tiled images, adverts on shops..
Italy is a fascinating place to visit each town seems to have something special waiting to be discovered. The regional attitude to cooking ensures that each area you visit will have their own food specialties to tempt you. The family life style of Italians is a pleasure to witness when they get together to enjoy a meal and seated around the table will be members of the family from the youngest baby to the nonna (grandma). There is usually much conversation and laughter at such gatherings. We have fond memories of when we traveled in Italy with our children and Italian ladies would stop us in the street to tell us how beautiful our children were. 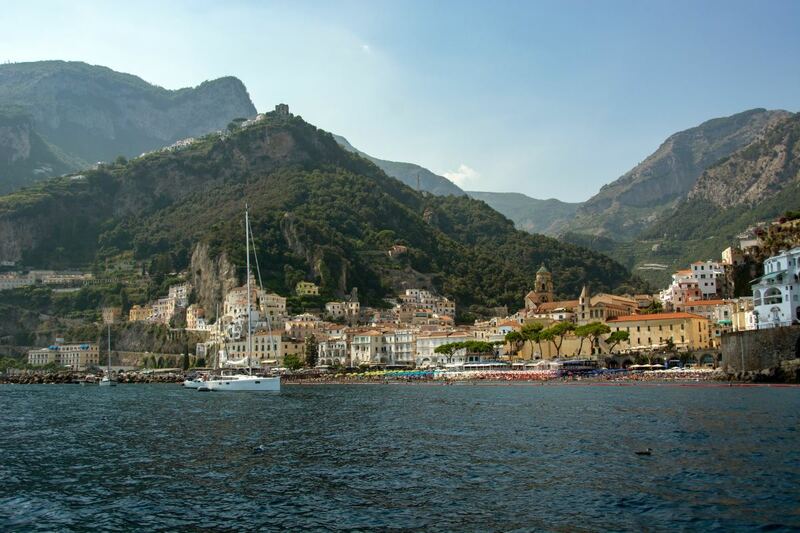 Italy, Italian cities to visit with photos. Photos and comments about visiting famous Italian cities and reasons you might want to visit them. Bologna,Rome,Florence,Pisa. Rome, photos of The Colosseum. 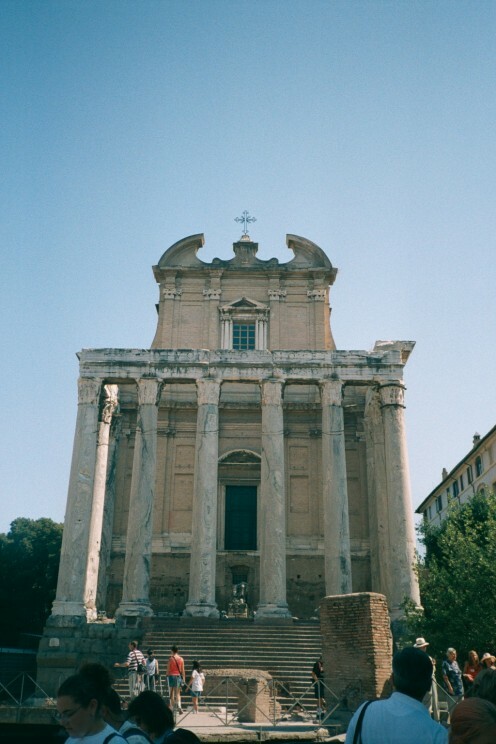 The Pantheon. A Temple . What Coffee to drink in Italy? Italian Cities to Visit - Bologna with photographs. Visits to Italian Cities. Bologna. Comments section on this page about Italy. Hope you had a wonderful time with your family including your kids. What a triple onslaught of alluring reasons to visit Italy ... first food, then wine, THEN Ice Cream ... YUM!! ... of course, the cities, people, markets are really the reason to go ... umm ... right (just trying to save face - my planning would admittedly focus on which great cafe's are IN the towns I would visit). Seriously, well-written and fun hub with great info and outstanding photos. Thank you Fabio your comment makes writing this article worthwhile. I grew to love Italy over many visits and each time I discovered something new and special to like. Nice article and I agree your ten reasons. My addition reason - soccer/football. Their fans is really fanatic. Great article, I hope to visit Italy with my family in the near future. Thank you, I have to agree I have never tasted ice cream as tempting as an Italian gelato and the choice of different flavors is incredible. I really like the way Italians take a pride in preparing the food they make even a basic meal can be special. I like the way the pizzas are cooked in the wood burning ovens the flavor is so much more intense and the pizza base is better when cooked that way. I have relatives through marriage that are Italian and watching them cook has made me a better cook. I have visited Italy twice. Both times were very memorable. Everywhere I went in Italy was beautiful. It doesn't matter if you are in a big city or a small rural village, Italy is beautiful. A feast for the eyes! The food and gelato ice cream were fantastic too! Hi travel2 I have to agree as they were the first ones I thought of. Even a cup of coffee or an ice cream/gelato in Italy is prepared with so much care that it makes you feel special. Thank you curious george - it is always good to know that the words and photos here are appreciated. i really liked this page! Hi Kim I hope you get to visit Italy some day soon. I am sure that the Italians will appreciate you being able to speak their language. Trains are a good way to get about in Italy they vary a lot, from slower country trains to really fast city link trains. The ice cream, food and wine, architecture and atmosphere make Italy a place worth visiting, enjoy. 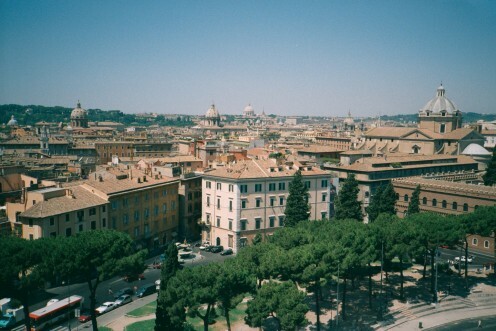 I'm studying Italian language at school and I really hope to travel to this country someday! Thank you,Italy is such a wonderful place to visit it has wonderful food and lots of historic places to see. So glad to have found a fellow hubber through Redgage! And to think I was already following you on here too!!! I have always wanted to visit Italy.... Can't wait to make it a reality after reading all of this! Thank you Leah, Italy is a wonderful place to visit. I really enjoyed reading this and now I want to visit Italy! Thank you David, Italy is a very interesting country to visit, lots of old buildings and history and lovely food. I find this very interesting indeed. Is helpful to those who needs it. Thanks. Sorry Micky I missed your comment here, not keeping up very well am I? Thank you. gulnazahmad, yes Italy is a beautiful place to visit lots of wonderful cities and the countryside is nice to. Thank you. Italy is a beautiful place and though I never visited it yet but I love Italian food and the places I have seen on TV and internet. My goodness! Was I asleep when this popped up? Thank you Dear 2uesday. I love your Italy hub! Thank you original, I am pleased you enjoyed your visits to Italy and that my article here reminded you of your memories of visiting Italy. I love Italy, and have excellent memories of my visits there, so thank you very much for the reminder and for a well written and informative article. Thanks Shinkicker - I hope to go back some time this year, so maybe I will have some new photos and cooking ideas too. I agree wholeheartedly with it. Italy is a wonderful country. Hi tuuesday , i really liked reading your hub it was great and the way you describe Itlay it sure makes me feel going there. I am sure i would include Itlay on my honeymoon trip. Hi Riviera Rose, yes I think it is the combination of them that makes the visit to Italy so rich and worthwhile. Typical of me to put food at the top of the list, I did not think about it when I numbered them. Love your reasons, and the order they come in! Such a wonderful country, with fantastic food and a great atmosphere. MPG Narratives - reading your comment I thought that sounds like fun. They really know how to celebrate in Italy do n't they ? I like to see the traditions in Italy the shop windows are wonderful at Easter or Valentine's Day. Also I think it is lovely to see the grown-up children return to visit for a meal at holiday week-ends carrying special cakes/torte and flowers for their mothers. I have never eaten ice-cream that tastes as good as Italian ice-cream or had so many flavours to choose from. Thank you for reading and leaving a comment here. Ciao. I share your enthusiasm for Italy and I am lucky enough to visit family when I do visit, very important to Italians is family as you mention. On our last trip we attended 3 festas and Italy won the world cup (not like this year!!!). Great photos too. Ciao. I moved to Umbria from Cardiff three years ago and totally agree with your list. I would also add festas, every week there is something being celebrated somewhere, with lots of food, music, dancing and of course fireworks at the end of the night. Thank you Frances - yes italian ice cream is fantastic, I never know which flavour to have there are so many. I have a photo of the Spanish Steps in one of my other Italian hubs. I hope you get to visit Italy again soon. 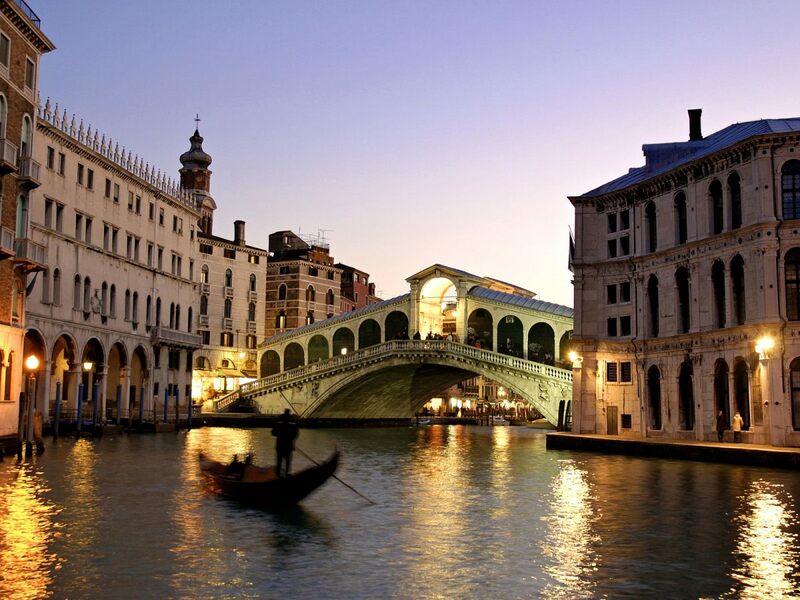 Venice is on the list of places I hope to visit in Italy - one day. I would like to see the historic buildings and the art there. Indigo good news - keep trying it is worth doing well with your studies. I was not allowed much time in education and have had to work hard since to catch up on the things I missed. Hope you get to visit Italy one day and try lots of the things mentioned here like real Italian ice cream. Thanks for letting me know. I got an "A" on my project. Thanks 2useday! Thank you boxxies - in the main tourist areas people in hotels etc. speak English so that helps. In other areas it is useful to have some Italian words, when we travel my husband can speak Italian so that helps. Enjoyed reading about Ten Good Reasons To Visit Italy. Would love to visit one day and practice my "little bit" of italian. Thank you lauralolita, Rome is an amazing city to visit so many ancient buildings - I have more photos in my Rome hubs of these. I hope you get to visit Italy one day. I didn't realize how beautiful Rome was! Great Hub! Riviera Rose - that's a nice Hubber name; thank you. Pleased you enjoyed this Hub, I hope to post another one soon on Itlay. I lived in Rome for a while - you've made me nostalgic! A great hub, thanks. Thanks itakins - we are lucky that it only takes a couple of hours (all being well) to fly to Italy. In the past I have done the trip as a passenger in a car; that took two days travel with an overnight stop in Aosta. Thanks for looking in. wow - thanks Indigo it is great news that this has helped you with your research. I am pleased that the lucky button helped you to find this. Wishing you good luck with your project. Im a high-schooler writing a research paper about Italy, the project calls for finding three things in a country of our choice that would be worth visiting the country for. Your list helped me alot in starting my research it was quite serendipitous that i discovered your list after hitting the "Im feeling Lucky" button. Thank you borge - Italy is a great place to visit. cmjo - I hope you get to visit Italy soon. Thank you for reading and leaving a comment here. I'd love to visit Italy. I'm 100% Italian and I've always wanted to go. Great Hub! thank you very much hypnodude for reading and rating this travel hub. Thank you all for the comments, Italy is worth visiting the experience is unique. Italy is beautiful and well worth visiting daisyjae; thank you for leaving a comment on this. Italy is on my list of places to visit. It looks beautiful. Mmm, real Italian ice cream - oh I'm sold! Thanks for the great hub. I'm planning on going to Europe at the end of the year but I'm having trouble deciding what country to go to. So thanks for the helpful tips. Ciao and thank you. You are very lucky to live in such a beautiful city. I wish to return to Florence one day I have only visited briefly and know there is so much to see and do there. 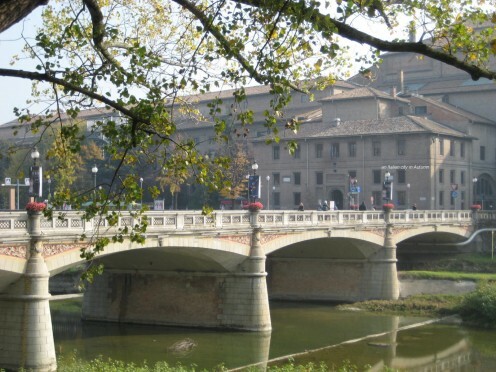 My most recent trip to Italy was to Parma in the Autumn as we have people we visit there. Grazie. Ciao! Very nice article. I live in Florence but I have worked all over this fantastic country so I recognize some of your photos. Brava! Luanne I hope you get to visit Italy and the relatives there soon and thank you for reading and leaving a comment for me. You have me sold...I hope one day to make it there. My grandfather came from Italy (Pasquale) and I have relatives that I've never met still living there. Thanks for sharing the great photos too! Hi donna I have two poems on the Autumn trees in the Italian park hub, but they are more about the leaves and trees than the place. Let me think about it you may have given me food for thought here.. thank you and also for the encouraging comment.